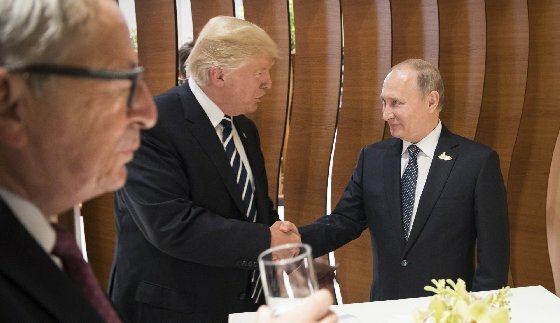 Vladimir Putin presented President Donald Trump with a series of requests during their private meeting in Helsinki last month, including new talks on controlling nuclear arms and prohibiting weapons in space, according to a Russian document obtained by POLITICO. A page of proposed topics for negotiation, not previously made public, offers new insights into the substance of the July 16 dialogue that even Trump’s top advisers have said they were not privy to at the time. Putin shared the contents of the document with Trump during their two-hour conversation, according to a U.S. government adviser who provided an English-language translation. Details in the single page agenda for the meeting shows Mr. Putin remains interested in maintaining continued cooperation with the US on nuclear weapons. A source who did not wish to be identified after obtaining the page translated from Russian into English by Politico, said: “This is, ‘We want to get out of the dog house and engage with the US on a broad range of security issues.” The document fails to address questions raised about what the Russian government meant last month when it said “cooperation in Syria” would be discussed between the two presidents and what they agreed to as a result. Treaty Structure: The Treaty between the United States of America and the Russian Federation on Measures for the Further Reduction and Limitation of Strategic Offensive Arms also known as the New START Treaty. Strategic Offensive Reductions: The Treaty between the United States of America and the Russian Federation on Measures for the Further Reduction and Limitation of Strategic Offensive Arms, also known as the New START Treaty, entered into force on February 5, 2011. Under the Treaty, the United States and Russia must meet the Treaty’s central limits on strategic arms by February 5, 2018; seven years from the date the Treaty entered into force. Each Party has the flexibility to determine for itself the structure of its strategic forces within the aggregate limits of the Treaty. These limits are based on the rigorous analysis conducted by Department of Defense planners in support of the 2010 Nuclear Posture Review. Verification and Transparency: The Treaty has a verification regime that combines appropriate elements of the 1991 START Treaty with new elements tailored to the limitations and structure of this Treaty. Verification measures under the Treaty include on-site inspections and exhibitions, data exchanges and notifications related to strategic offensive arms and facilities covered by the Treaty, and provisions to facilitate the use of national technical means for treaty monitoring. To increase confidence and transparency, the Treaty also provides for an annual exchange of telemetry on an agreed number of ICBM and SLBM launches. Treaty Duration: The Treaty’s duration is ten years, unless superseded by a subsequent agreement. The Parties may agree to extend the Treaty for a period of no more than five years. The Treaty includes a withdrawal clause that is standard in arms control agreements. The 2002 Moscow Treaty terminated when the New START Treaty entered into force. No Constraints on Missile Defense and Conventional Strike: The Treaty does not constrain testing, development, or deployment of current or planned U.S. missile defense programs or long-range conventional strike capabilities. What is the difference between a “Type One” and a “Type Two” inspection? The New START Treaty provides for 18 on-site inspections per year. There are two basic types of inspections. Type One inspections focus on sites with deployed and non-deployed strategic systems; Type Two inspections focus on sites with only non-deployed strategic systems. Permitted inspection activities include confirming the number of reentry vehicles on deployed ICBMs and deployed SLBMs, confirming numbers related to non-deployed launcher limits, counting nuclear weapons onboard or attached to deployed heavy bombers, confirming weapon system conversions or eliminations, and confirming facility eliminations. Each side is allowed to conduct ten Type One inspections and eight Type Two inspections annually. FNC: Russia used “chemical or biological weapons” to try to assassinate a former British spy, the U.S. said on Wednesday, adding that new sanctions would be imposed on the country for the attack. Skripal and his daughter were poisoned by the military-grade nerve agent in the British town of Salisbury in March. Britain earlier accused Russia of being behind the attack, which the Kremlin has vehemently denied. On March 15, President Trump, French President Emmanuel Macron and German Chancellor Angela Merkel and British Prime Minister Theresa May said in a joint statement that they “abhorred” the attack against Skripal. “It is an assault on U.K. sovereignty and any such use by a State party is a clear violation of the Chemical Weapons Convention and a breach of international law. It threatens the security of us all,” the statement read. Skripal was discharged from a U.K. hospital in May, following his daughter’s April release.